The painting adopts the dark tones of Landseer's later works. The scene shows two polar bears among the scattered wreckage of the expedition - a telescope, the tattered remains of a red ensign, a sail, human bones - which William Michael Rossetti called "the saddest of membra disjecta". The image shows humanity and civilisation defeated by "nature, red in tooth and claw", and can be seen as a commentary on the crisis of British triumphalism and imperialism in the middle of the 19th century. The phrase "Man proposes, but God disposes" is a translation of the Latin phrase "Homo proponit, sed Deus disponit" from Book I, chapter 19, of The Imitation of Christ by Thomas à Kempis. Truth # 2: It is wise to plan - yet understand that the Lord is ultimately sovereign over all: Proverbs 16:1, "The plans of the heart belong to man, but the answer of the tongue is from the Lord. "; 3, "Commit your work to the Lord, and your plans will be established"; (9), "The heart of man plans his way, but the Lord establishes his steps." What can I do to improve my spiritual condition? The first is to be saved! Be found "in Christ". Be certain of one's eternal destiny. Hell is real and some are not far from it! 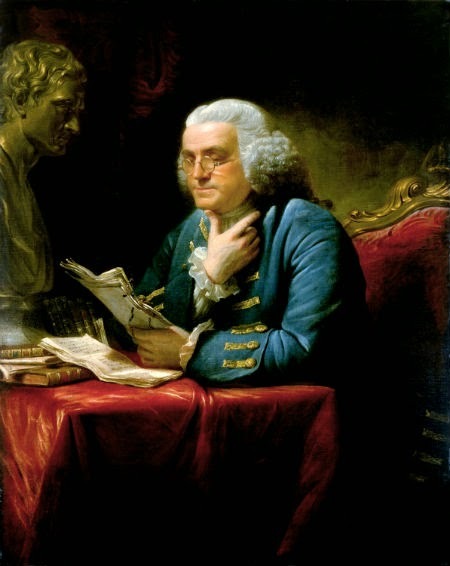 For the Christian: what may one do to be be more devoted, more like Christ, more faithful? What can I do to improve my physical condition? Lose 10 lbs? Walk more steps? Et cetera. What can I do to improve my financial condition? Further one's education? Pay down debt? Save more? 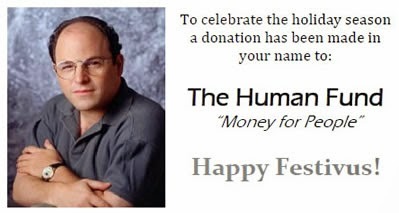 Have an emergency fund? Save for retirement? Et cetera. Comment: If you can't celebrate the joy of Christmas ... well ... My basic principle is to not be a busybody .... not be in the business of others: How they spend their money, what career choices they make, where they choose to travel, the cars they choose to buy (houses too). 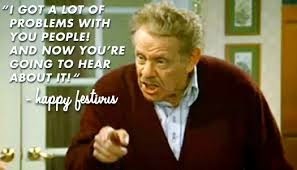 In other words ... mind your own business! 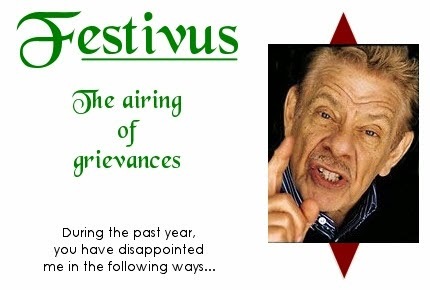 Wiki article on Festivus. There's even an official site! President Obama Condemns Both ‘Disgusting’ Anti-Islam Video And ‘Mindless’ Violence Before The U.N. 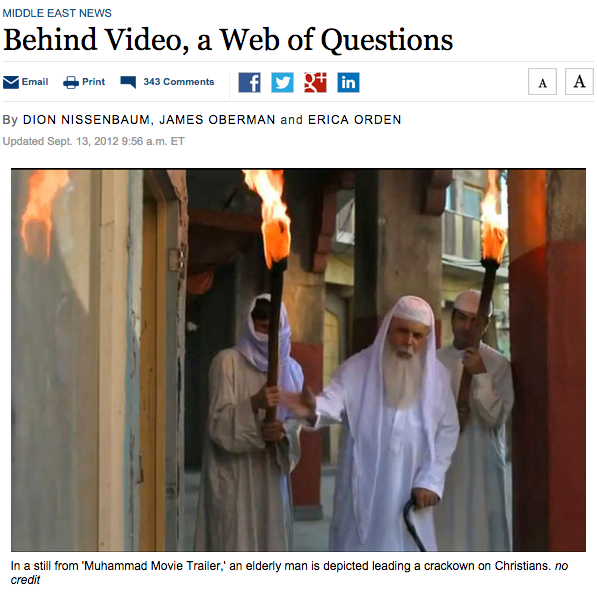 Image sources: Muslim film screen snap from the WSJ ... The Interview from WIKI. 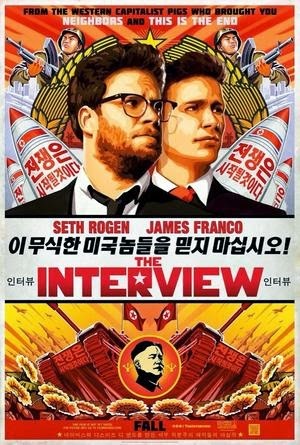 The other film was professionally produced at significant cost and really did offend a foreign leader. The other was pulled and Obama wanted it distributed. A Toronto man who made headlines last month by offering a free round-the-world air ticket to a woman with the same name as his ex-girlfriend has found Ms. Right. 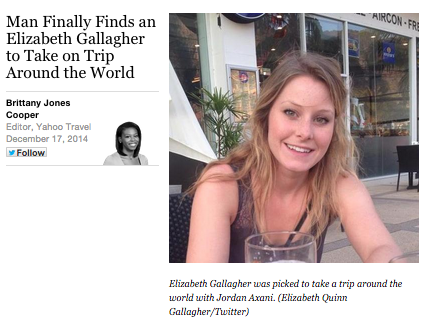 Jordan Axani, 28, and his then girlfriend, named Elizabeth Gallagher, booked heavily discounted round-the-world air tickets in May, but their relationship ended and he didn't want her ticket to go to waste. The ticket had a strict no-transfer policy, but since passport information was not required when booking, it can be used by any Canadian named Elizabeth Gallagher. Axani posted his offer last month on the popular Reddit social media website, and received thousands of emails, including 18 from actual Elizabeth Gallaghers with Canadian passports. He's now chosen his travel mate, Elizabeth Quinn Gallagher, a 23-year-old student and part-time office administrator from Cole Harbour, Nova Scotia. "It's strictly a platonic trip. It's going to be great," Axani said. At first the new Elizabeth Gallagher thought a trip with a stranger whose ex-girlfriend's name is the same as hers was "crazy" but she hit it off with Axani after talking on the phone with him for hours. "It definitely did seem a little bit creepy at the beginning but now that I talked to him it's less creepy and more awesome," she said. Republican Martha McSally won the seat in Arizona's 2nd Congressional District, the recount confirmed Wednesday. It was the last congressional race to be decided in the country. McSally beat one-term Democratic incumbent Ron Barber by 167 votes in a contest declared final 43 days after the election. That is six votes more than the margin McSally held when the vote count was completed originally. McSally and Barber were scheduled to give interviews to reporters later Wednesday. McSally released a statement calling for healing in the district over the closeness of the race and praising Barber for his work. 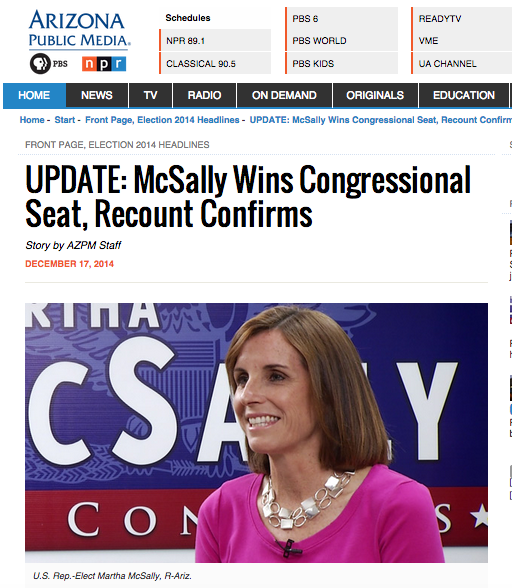 "There's no getting around that this was an incredibly close and hard-fought race," McSally's statement said. "After what's been a long campaign season, it's time to come together and heal our community. That's why my focus will be on what unites us, not what divides us, such as providing better economic opportunity for our families and ensuring our country and community are kept safe." She thanked Barber "for his service over many years to Southern Arizona. I'll be seeking his input to continue strong constituent services and help ensure a smooth transition." In his own statement, Barber congratulated McSally and promised to work for a smooth transition. "Today I congratulated Martha McSally on her victory, and wished her well in serving Southern Arizonans," Barber's statement said. "This result is not the one we hoped for, but we take solace in having spoken out loud and clear for the principle that every legal vote should be counted." 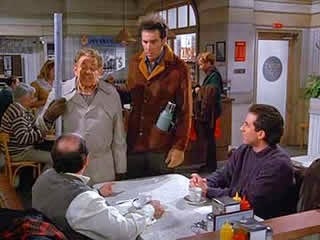 That was an apparent reference to Barber's legal team seeking, unsuccessfully, to have about 133 disqualified votes counted. His statement of concession indicated he won't pursue further legal challenges to the outcome. The race went to a recount because the margin between the two candidates following the Dec. 1 certification and canvass was fewer than 200 votes. Secretary of State Ken Bennett, whose office supervised the recount in Pima and Cochise counties, announced the results on his Twitter account at 10:07 a.m. Wednesday. McSally's victory gives Republicans 247 seats in the U.S. House of Representatives, to 188 for Democrats. That is the largest number of seats held by one party in Congress since 1928, the National Republican Congressional Committee said in a statement. Comment: See previous post. Sharp cookie .... see Wiki article. 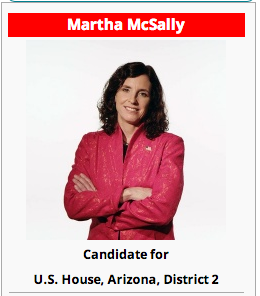 Martha McSally (born March 22, 1966) is a retired United States Air Force Colonel. 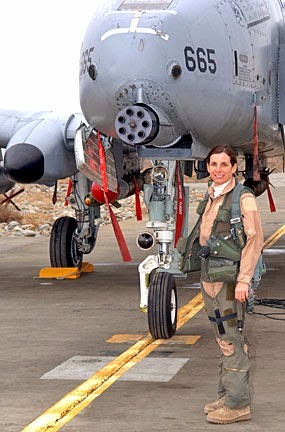 She was the first American woman to fly in combat since the 1991 lifting of the prohibition of women in combat, flying the A-10 over Iraq and Kuwait in support of Operation Southern Watch. She is the first woman to command a USAF fighter squadron, the 354th Fighter Squadron (354 FS) based at Davis-Monthan Air Force Base. 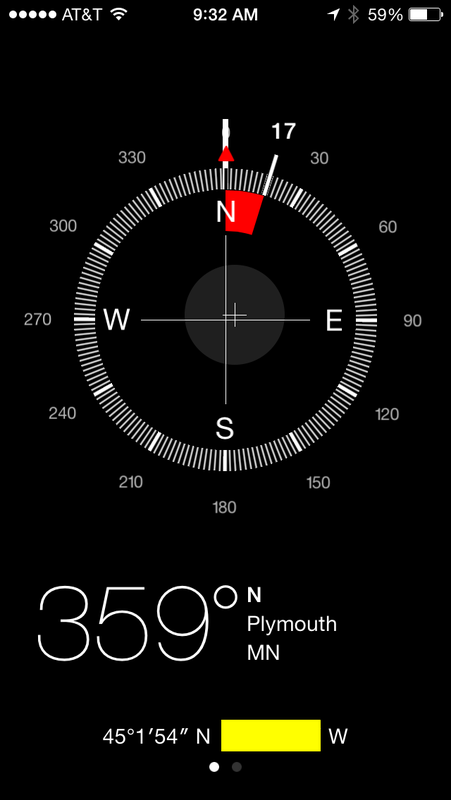 Here is a somewhat dubious superlative for the city of Minneapolis, suitable for any boostering or anecdotal purposes: It is the largest city in North America to be located exactly halfway between the Equator and the North Pole, right on the 45th parallel. Minneapolis (population 400,700, despite what the signs on the freeway say) would be the largest such city in the world, but unfortunately, there are two Eurasian cities with larger populations also crossed by the line. The 45th parallel runs near a commemorative obelisk in the Piazza Statuo in Turin, Italy (population 908,551), and then through an industrial park on the very southernmost tip of the Russian city of Krasnodar (population 744,995). But biggest in North America’s not bad. 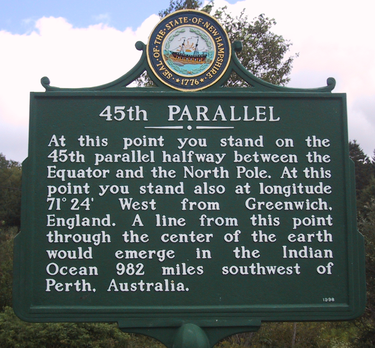 The 45th parallel is the imaginary circle of latitude bisecting the Northern Hemisphere, 45 degrees north of the Equator and another 45 degrees from the North Pole. In the Twin Cities, the 45th parallel runs through the western suburbs, over Medicine Lake, then through Golden Valley and North Minneapolis, running just a few yards south of 21st Avenue North. 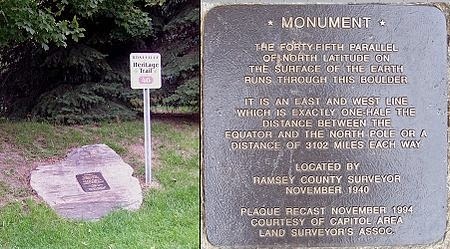 It crosses the Mississippi into Northeast Minneapolis, almost exactly halfway between 12th and 13th Avenues Northeast, then Roseville, Lake Elmo, and finally across the St. Croix into Wisconsin and points east – Michigan, Vermont, France, Croatia, the Crimea, Inner Mongolia, Hokkaido in northern Japan, the Kuril Islands, Oregon, the Montana/Wyoming border, and back again through Plymouth. Comment: Other images from the Wikipedia article. For more than a century, elevators have helped shape skylines around the world largely through the same technology: a car pulled up and down by a cable. 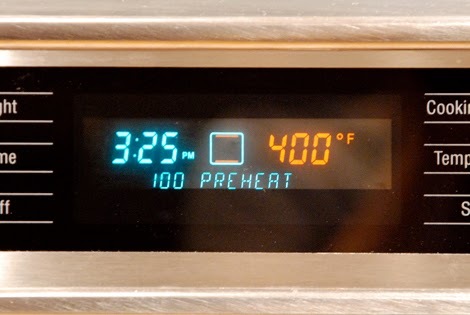 A new technology could change that. Manufacturing giant ThyssenKrupp AG is rolling out a cable-free elevator, a technology that—if it works as advertised—would allow multiple cars to run in the same shaft, and to run not just up and down but also diagonally and sideways. 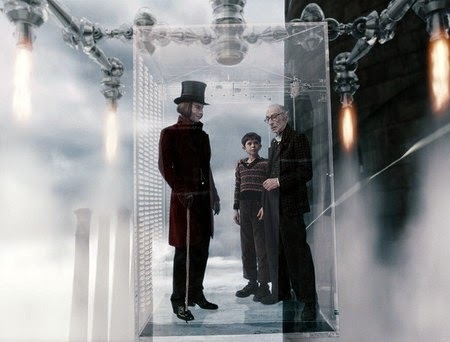 While not quite on the level of Willy Wonka’s Great Glass Elevator, such a technology would permit buildings to stretch higher, with less space for elevator shafts, and to expand in new shapes, architects and engineers believe. “I could almost not think of a technology that has the potential to fundamentally change tall buildings like this one,” said Antony Wood, executive director of the Chicago-based Council on Tall Buildings and Urban Habitat, a skyscraper trade group. General Motors Company (GM): Comment: Not a GM fan (although I have 2 GM cars). Skeptical. 3.8% yield. Unum Group (UNM): Comment: 2% yield. I know almost nothing about this company. NextEra Energy (NEE): Comment: 2.9% yield. Acquisition of Hawaii Electric just announced. McDonald's (MCD): Comment: 3.8% yield. W.W. Grainger (GWW): Comment: 1.8% yield. High stock price of $ 244. Ivan in my AFB class works here. Sherwin-Williams (SHW) : Comment: .9% yield. High price of $ 245. AT&T (T) : Comment: 5.7% dividend yield. Mom's stock. Consolidated Edison (ED): Comment: 4% yield. "the only utility stock in the Dividend Aristocrats Index. The company provides electricity to 3.3 million New Yorkers and gas to another 1.1 million customers. Consolidated Edison has increased its dividend payments for 40 consecutive years"
Grupo Aeroportuario Sureste (ASR): Comment: 2.7% yield. "Grupo Aeroportuario del Sureste, S.A.B. de C.V. holds concessions to operate, maintain, and develop airports in the southeast region of Mexico." UIL Holdings Corp (UIL): Comment: 4.1% yield. "UIL Holdings Corporation, through its subsidiaries, operates in the regulated utility businesses. The company operates in the Electric Distribution, Electric Transmission, and Gas Distribution segments." 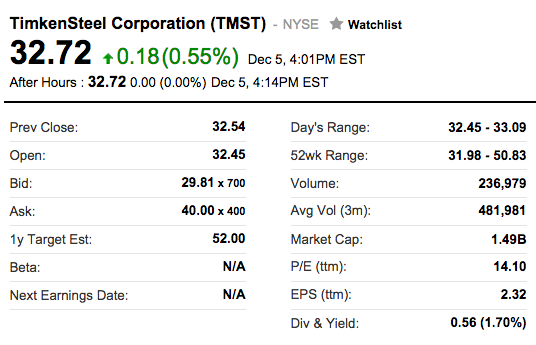 Hospitality Properties Trust (HPT): Comment: 6.3% yield: "Hospitality Properties Trust, a real estate investment trust (REIT), engages in buying, owning, and leasing hotels." Safety Insurance Group Inc (SAFT): Comment: 4.7% yield: "Safety Insurance Group, Inc. provides private passenger automobile insurance products primarily in Massachusetts and New Hampshire." LTC Properties Inc (LTC): Comment: 4.8% yield. "LTC Properties, Inc. operates as a health care real estate investment trust (REIT) in the United States." Spectra Energy Partners LP (SEP): Comment: 4.4% yield. " Spectra Energy Partners, LP operates as an investment arm of Spectra Energy Corp."
Russian media across the country from St. Petersburg to Siberia reported exchange points running out of foreign currency and jacking up rates. Sberbank , Russia’s state savings bank, and Alfa Bank, Russia’s largest private lender, said they were experiencing a rush for dollars and euros. “The demand is enormous. People are bringing piles, huge piles of cash. It’s madness,” said Kamila Asmalova, a manager at a downtown branch of Sberbank. The branch ran out of foreign currency by 2 p.m., she said. Tatiana Malkova, a receptionist at a Raiffeisen Bank branch in central Moscow, said demand rose dramatically Monday evening as the ruble plunged. The bank ran out of dollars and euros in its ATMs in the morning, but expects a delivery on Wednesday, she said. Midsize Moscow lender Lanta Bank said its foreign counterpart would be unable to send foreign currency Wednesday as aircrafts that transport cash are full. She's lost "the new car smell"
People Magazine’s worst selling issue this year? The one with Hillary Clinton on the cover. 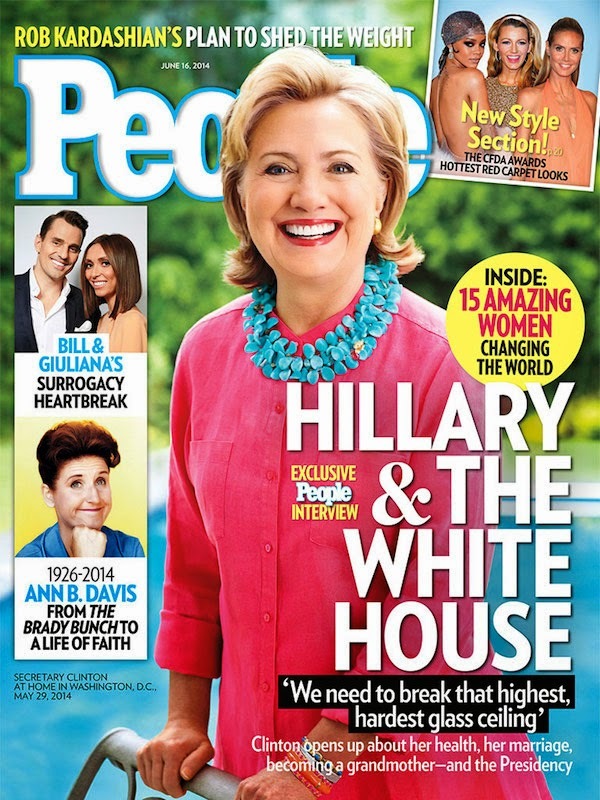 According to a report from AdWeek on Monday, the June 16 issue of People featuring the former first lady and senator was the magazine's worst selling of 2014 with 503,890 copies sold. ... The federal Protection of Lawful Commerce in Arms Act, signed into law in 2005, shields gun manufacturers from most lawsuits. The basis for the Newtown suit stems from one exception under the law, so-called negligent entrustment lawsuits. Under such actions, one party can be held liable for entrusting a product to another party who then causes harm to a third-party. ... Lawrence Keane, senior vice president and general counsel of the National Shooting Sports Foundation, an association that represents the firearms industry, said the lawsuit was without merit. “It’s exactly the kind of lawsuit the Protection of Lawful Commerce in Arms Act was designed to stop,” Mr. Keane said. Mr. Keane also rejected the idea that the rifle was unfit for civilian use. “Millions of people own them and do use them every day for lawful purposes,” he said. Dennis Henigan, former director of the Legal Action Project at the Brady Center to Prevent Gun Violence, said the lawsuit would test the limits of the negligent-entrustment legal theory. “The issue in this case will be whether courts are willing to construe the doctrine of negligent entrustment so broadly as to encompass a theory of liability that is based on the sale of a particular gun to the general public instead of to a potentially particular dangerous individual,” Mr. Henigan said. 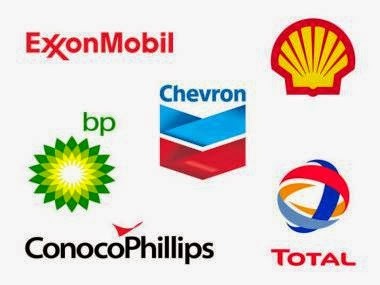 Big Oil: A Safe Investment? The Twin Cities, however, is dominated by two firms, Coldwell Banker Burnet and Edina Realty, that were once family-run but now are affiliates of national firms. Edina Realty, for example, was founded by Emma Rovick, a housewife from south Minneapolis who started selling real estate to help raise money to buy her daughter a piano. The company is now an affiliate of Berkshire Hathaway’s HomeServices of America. Together, those two companies closed nearly 50,000 transaction sides (the listing and selling sides of a home sale) last year, according to Real Trends, a national real estate trends firm. The next biggest is ReMax Results, which had 16,165 transaction sides. 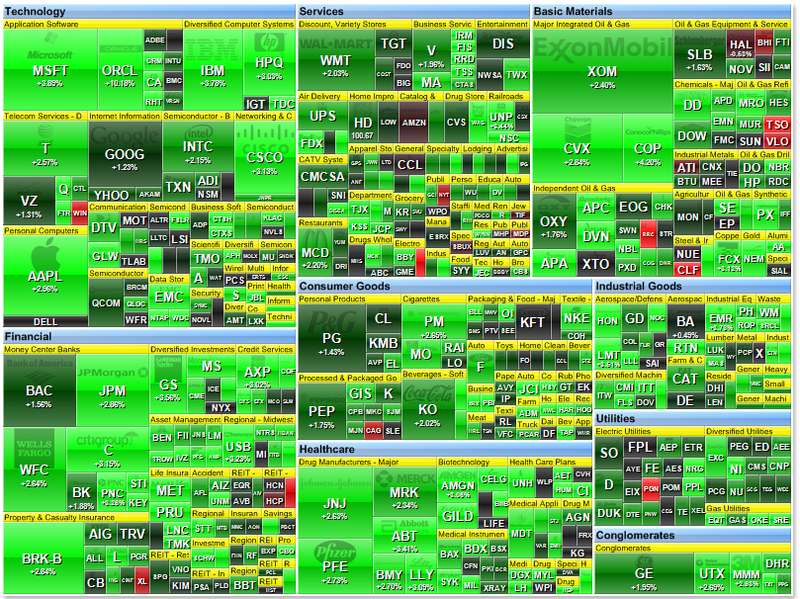 Fazendin doesn’t report its transaction volume. Steve Murray, editor of Real Trends, said that Fazendin is one of only a few companies that have been owned and managed by the same family for three generations. Among all U.S. small businesses, fewer than 3 percent of them make it to the third generation. Comment: We bought through Counselor Realty almost 19 years ago. We have been working with Ray Klotz of Edina Realty. Other realtor sites mentioned: Fazendin Realtors, Coldwell Banker Burnet, and ReMax Results . 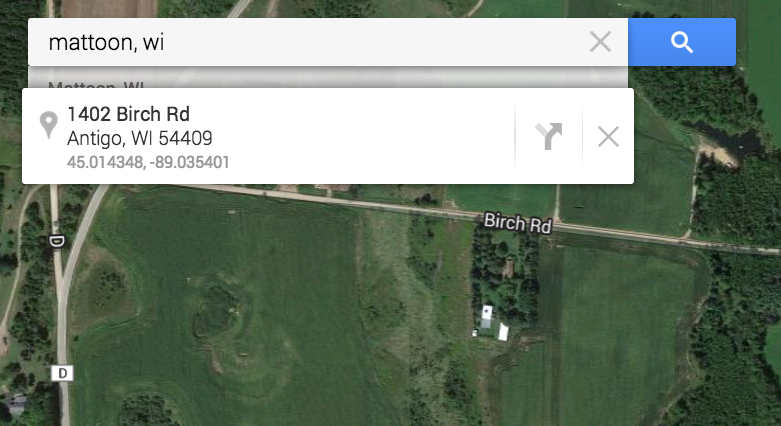 Our "go to" site for researching real estate is Edina. Image above is screen snip from website. "Calling it #EatenAlive is like having a show on the Food Network about cooking a turkey and all they do after 2 hours is preheat the oven"
Apparently the only thing worse than promising a man will be eaten alive by an anaconda is for a man to not be eaten alive by an anaconda. Many viewers felt Discovery had pledged adventurer Paul Rosolie would be utterly consumed by an anaconda on his special Sunday night. After all, the show was called Eaten Alive and its official programming guide description told viewers that a man “enters the belly of an anaconda.” What viewers eventually saw during the two-hour special was a large anaconda attack Rosolie, coil around him, then start to eat his helmet. That’s when Rosolie had to call in his team to rescue him, saying his arm was being crushed. “I started to feel the blood drain out of my hand and I felt the bone flex, and when I got to the point where I felt like it was going to snap I had to tap out,” he said. Former NBA player, Antoine Walker, 38, earned over $110 million throughout his NBA career, more than four times the average player in the league. All that money, though, didn’t stop this All-Star from going broke. 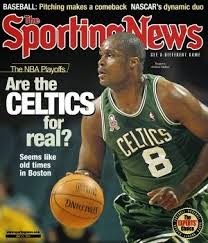 Walker’s financial problems began his first year in the league as a 19-year-old rookie with the Boston Celtics in 1996. Although he had a financial advisor help him establish a plan for his long-term finances, Walker had other ideas about what he wanted to do with his newfound wealth. “Through my young arrogance, being ignorant to a degree and being stubborn and wanting to do my own thing with my money, I went against a lot of his wishes,” Walker told Yahoo Finance. ... He quickly acquired a taste for the finer things and upgraded his entire family to live in multi-million dollar homes that he built from the ground up. His driveways were filled with four to five luxury cars -- from Bentleys and BMWs, to his prized $350,000 Maybach. And as one of the most fashionable ballers, Walker never wore the same designer suit twice. His generosity extended beyond his family to his many friends and acquaintances. From lavish all-expenses-paid trips to luxury gifts for his friends, Walker made sure everyone in his circle enjoyed the lifestyle he led. With his fellow NBA players, Walker gambled extensively – losing $646,900 in just two years. Even as his spending spiraled out of control, Walker had a plan to put his income to work and bought more than 140 properties along the South Side of Chicago. Whether it was land to build on or commercial and income properties, Walker had a full-range of real estate investments meant to maintain the lifestyle he had built for his family after retiring from the league. With the housing bubble and bust, Walker found himself defaulting on loans where he was the personal guarantor, losing value on land, and failed to get a handle on the legal issues that followed. Comment: Prophetic words from Reagan! Crunching reams of data in search of undervalued stocks, analysts at Relational Investors, a firm that manages $6 billion mostly on behalf of pension funds, happened upon a Canton company called Timken, which was in the unglamorous business of making steel and bearings. Controlled by the Timken family for more than a century, the company looked cheap compared with its industrial peers, at least according to Relational’s analysis. 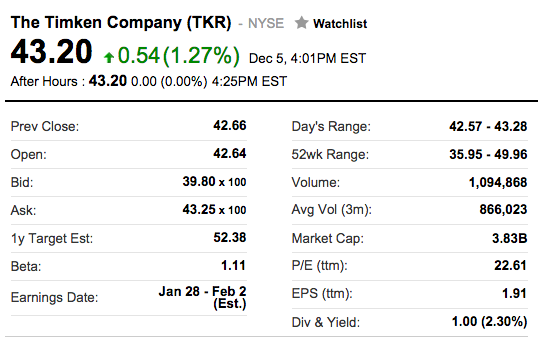 A few more calculations suggested that Timken’s shares might fetch more if the company were split in two. Throughout the summer and fall of 2012, Relational’s traders in San Diego quietly accumulated shares, and by November, the firm owned nearly 6 percent of Timken. Relational is not a typical buy-and-hold shop. On Wall Street, it is what’s known as an activist investor, one of a number of increasingly powerful firms that acquire big stakes in companies and pressure executives to make changes to “unlock value” and drive share prices higher. After focusing on smaller companies with dysfunctional management and languishing shares, activist investors are now taking on some of the most prominent — and successful — giants, including DuPont, Amgen, Procter & Gamble, eBay, and even Apple, the single most valuable American company. 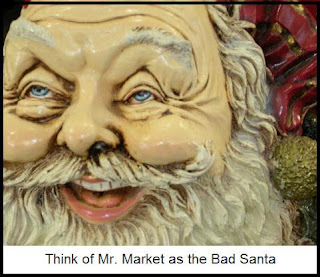 As a result, they’ve become something of a boogeyman in corporate boardrooms, pushing for bigger buybacks, fatter dividends and sometimes new chief executives. In the case of Timken, the activists demanded the breakup of the company. And last summer, after a contentious public fight and a shareholder vote, Timken relented, splitting itself into two companies, one focused on bearings, the other on steel. One race still must be decided. In a Democratic-held district in the Tucson, Arizona-area, an automatic recount will determine whether Rep. Ron Barber keeps his seat or Republican challenger Martha McSally prevails. McSally led by fewer than 200 votes. If McSally wins, Republicans would have 247 seats, the largest majority since 1929-31 when the GOP controlled 270 seats in President Herbert Hoover's administration. Comment: In recount. McNally leads by less than 200 votes. More here and here. Republican Bill Cassidy has defeated Democratic Sen. Mary Landrieu, giving the GOP another victory in the final election of the 2014 midterms. Cassidy's win in Louisiana's Saturday runoff pushes the Republican's new Senate majority to 54 seats in January and costs Democrats their last Senate seat in the Deep South. 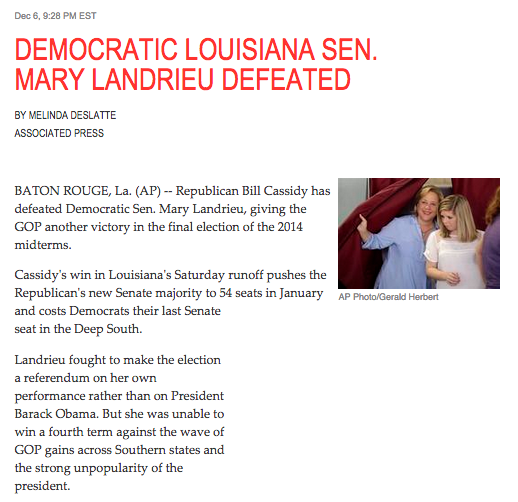 Landrieu fought to make the election a referendum on her own performance rather than on President Barack Obama. But she was unable to win a fourth term against the wave of GOP gains across Southern states and the strong unpopularity of the president. All past market crashes are viewed as opportunities, but all future market crashes are viewed as risks. “I don’t know” are three of the most underused words in investing. Things change quickly—and more drastically than many think. Three of the most important variables to consider are the valuations of stocks when you buy them, the length of time you can stay invested, and the fees you pay to brokers and money managers. A couple of times per decade, investors forget that recessions happen a couple of times per decade. Don’t check your brokerage account once a day and your blood pressure only once a year. You should pay the most attention to the investor who talks about his or her mistakes. There is no such thing as a normal economy, or a normal stock market. It can be difficult to tell the difference between luck and skill in investing. You are only diversified if some of your investments are performing worse than others. Fourteen years ago, Enron was on Fortune magazine’s list of the world’s most-admired companies, Apple was a struggling niche company, Greece’s economy was booming, and the Congressional Budget Office predicted the federal government would be effectively debt-free by 2009. There is a tendency to extrapolate the recent past, but 10 years from now the business world will look absolutely nothing like it does today. The rise of the first black president helped accelerate the white migration to the Republicans, which was reflected in the Republican tide that swept away many surviving Democratic officeholders across the South in November. And Louisiana lost a hefty chunk of its black population after Hurricane Katrina. 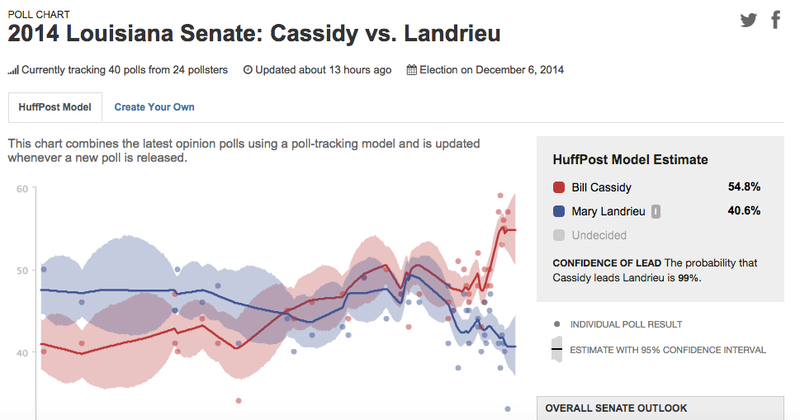 Ms. Landrieu was the top vote-getter in Louisiana’s nonpartisan primary in November. But Mr. Cassidy, a 57-year-old doctor, has hewed closely to his party’s recent strategy of nationalizing congressional elections. 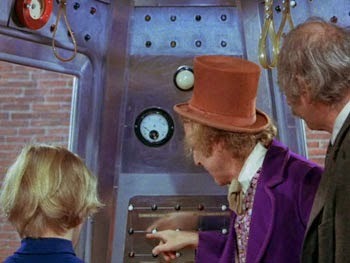 He and outside spending groups have reminded voters that Ms. Landrieu voted with President Obama 97 percent of the time. They have also criticized her for voting in favor of the Affordable Care Act, characterizing it as the “deciding vote for Obamacare.” But other numbers are just as ominous for Ms. Landrieu. Elliott Stonecipher, a political analyst in Shreveport, La., said that the growing degree to which whites have become Republicans and the loss of an estimated 125,000 Democratic voters after Hurricane Katrina in 2005 meant that Democrats now represented about 47 percent of Louisiana’s overall voter registration, compared to more than 60 percent in 2000. Ms. Landrieu was able to overcome that problem in 2008 in part because of Mr. Obama’s presence on the ticket and the lift it gave to Democratic turnout, Mr. Stonecipher said. But this time, Ms. Landrieu is alone. “She has literally been watching the power of her political brand disappear,” he said. There remains the formality of a runoff election on Saturday — but as far as the national Democratic Party is concerned, three-term Sen. Mary Landrieu of Louisiana is presumed dead. The Democratic Senatorial Campaign Committee canceled its plans to buy ads and is not lifting a finger — or writing a check — to save her. Nor are any of the heavy-hitting Democratic outside groups. Turns out there's some truth to "You're Not You When You are Hungry"
The brain is as real a blood-and-guts biological entity as… your blood and guts. The brain requires tons of energy—at rest, it consumes about 25% of your circulating glucose, despite constituting only about 3% of your body weight. As you carry out a particular behavior, the rate of glucose consumption jumps in the pertinent brain region. If you listen to a symphony, your auditory cortex elevates the metabolic rate. If you learn something new, it’s the hippocampus that fires up. Tap dancing sparks the motor cortex. And when you’re displaying willpower, thinking, “Don’t do it, don’t do it, you’ll regret it….” it’s your frontal cortex that kicks into gear. Volunteer married couples had their blood sugar levels monitored daily for weeks. Each evening participants rated the level of any anger they were feeling toward their spouse. Subjects indicated their level of anger through the number of pins they’d put into a voodoo doll representing their spouse. Comment: Why infants and toddlers cry!